We are staying the night of our wedding at the Lansdowne Club and we would be delighted if you would like to stay there for the night so we can share breakfast with you the next day. 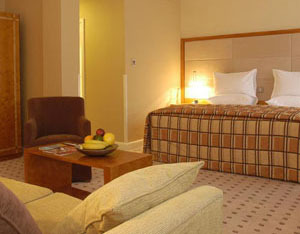 The Club offers a number of single, twin or double rooms and suites. We have looked at several of the rooms and they were all lovely and newly refurbished. Whilst the rooms are not what everyone would consider cheap we believe them to a bit of a bargin compared to what you pay for a comparable room at nearby hotels such as the Ritz. More details of the rooms, rates and how to book can be found here. Please note that the Club's dress rules must be adhered to. Men must wear a collared shirt (ties are not necessary) and women must be smartly dressed. Denim, casual trousers or trainers are not acceptable. Failure to comply with the dress code may result in admission to the Club being refused.